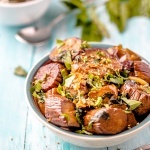 If you’re in the mood for stir fry or a side to go well with meat or poultry, this is it, try this eggplants stir-fry with basil. 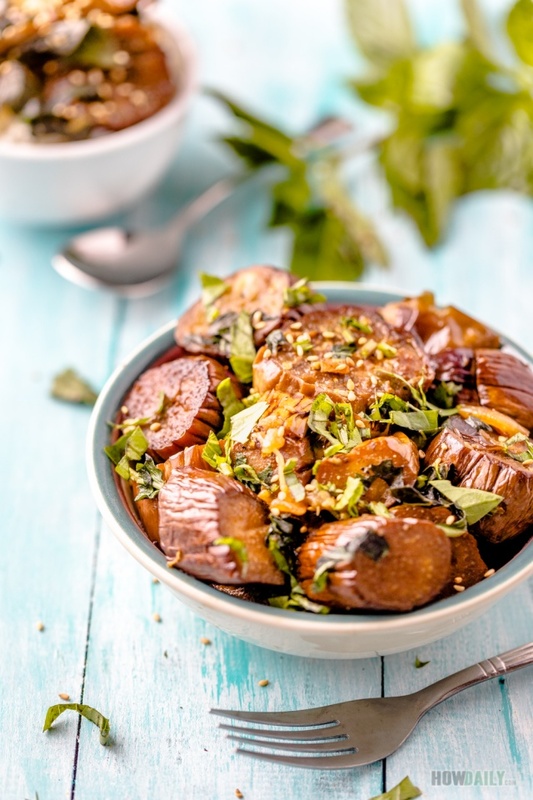 The whole dish is so easy to do, just plain eggplant, basil and some shallot/onion. These ingredients are fragrant enough to be discovered miles away. Strange is, they are compatible so well. To further enhance this scent, I would recommend to lightly roast the eggplants first. In my old times, we used to just pierce the skin a couple times with a fork and throw them straight into camp fire. 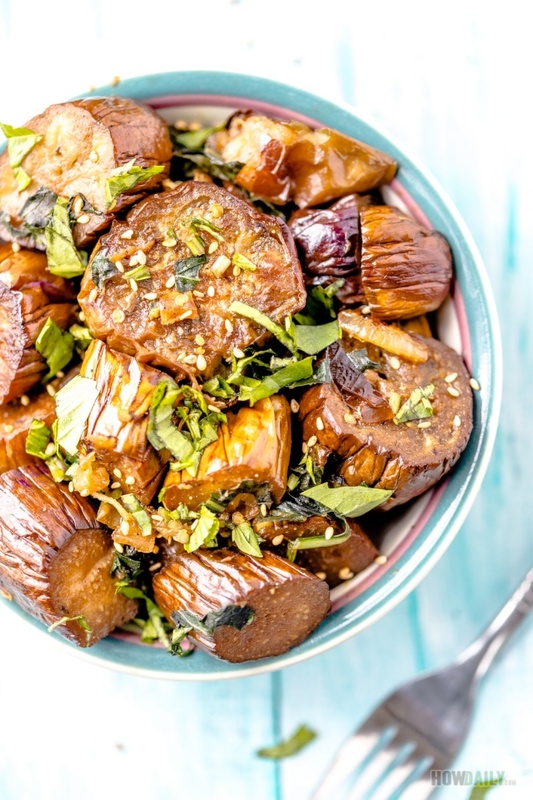 After roasting, just peel the skin off, cut the runny flesh a few times then stir fry with any herbs you could find: scallion, basil, cilantro… Out of them basil (of any kind) seem to complement the best while helping eggplant feel sweeter, in a scent. 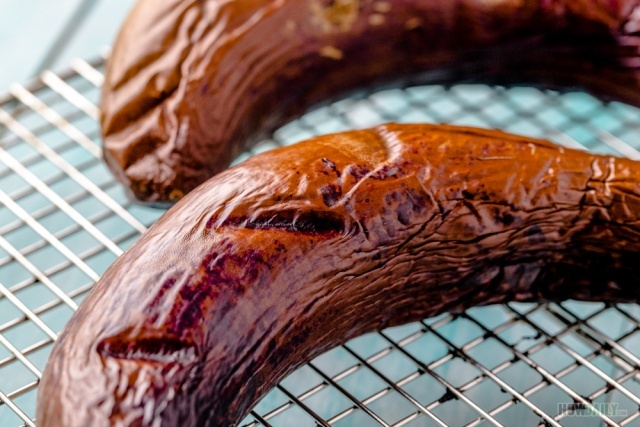 There are many kinds of eggplants: round, small, thick and thin… For this dish, any kinds of eggplants would work. Just pick the ones available at your grocery store. For seasoning, I would just use soy sauce, since it could flavor the dish well while bringing the brownish caramelized color. Look more appetite that way don’t you think? 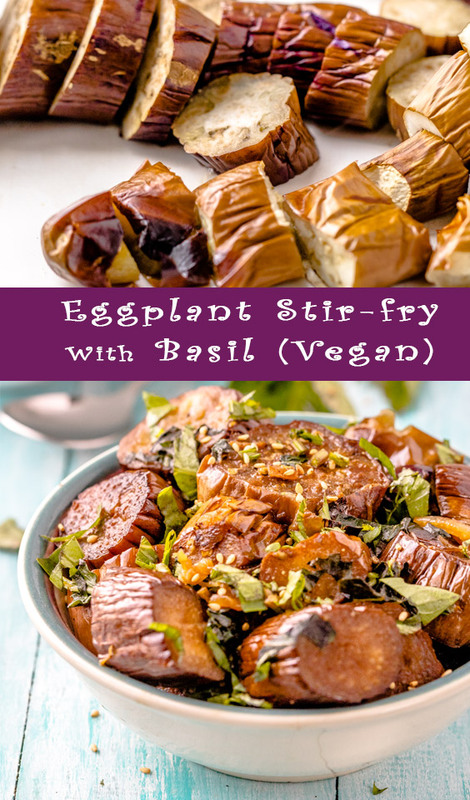 Now this dish is made without any meat or gluten product, so it’s totally vegan, low carb in a sense. However, if you want some protein, try ground turkey or chicken to make it quick. Small slices of steak would work too, though I think the taste of chicken seem to incorporate better. 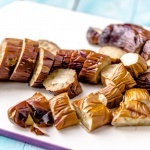 Cut eggplants into 1-inch thick chunks across their length. Finely slice shallot, chop basil too or leave whole as is. In a large sauce pan or skillet over medium high heat, add 1 Tbsp veggies oil. Tilt and twirl to coat surface. When oil is hot, add shallot, stir until soft and translucent. Now add in eggplants, stir for 30 seconds or so to cook the outside then add soy sauce to flavor. When the soy sauce are fully cover (and brown all eggplant chunks), add water or broth. Stir well to mix. Cook and stir frequently when almost all liquid is reduced, adjust seasoning to taste with some salt and ground pepper if need. Add basil. Stir well to mix and cook until basil pieces are wilt. Transfer to plate, sprinkle some roasted sesame if desired. Serve hot immediately.